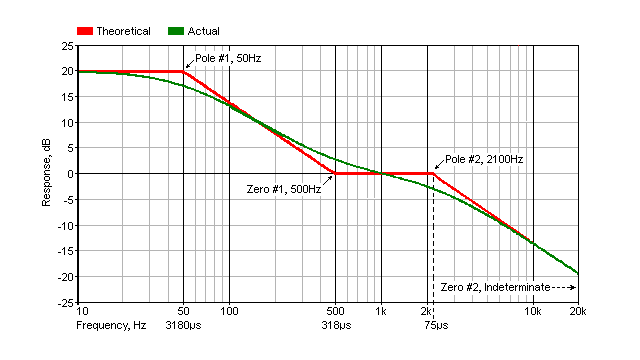 The passive RIAA Phono Equalizer is an appealing circuit from an audiophile perspective for 2 main reasons. The two amplifiers operate with a constant feedback gain. High Frequency overload is lower than an active feedback design but this seems never to create problems in real world applications. The only concerns are to be sure that the driving tube V1 has a low enough output impedance relative to R1 and that the following tube V2 has an input impedance of at least 50 times R1 to prevent loading. You can enter data for R1 and for the 3 frequency settings. Those frequencies represent corner frequencies of the 3 stages of the RIAA curve, the low end, the mid and the treble. If you have a different curve you would like to equalize, input the frequencies of interest and the calculator will give you the component values. The form calculates the exact values for R2, C1 and C2. Resistors and Capacitors are usually not available with exactly these values. However, with a circuit of two E24 resistors or capacitors, you can often approximate these values quite good. The calculator finds 2 E24 resistor and 4 E24 capacitor values an that best matches the value. Please keep in mind that the output impedance of the first stage V1 throws the network time constants off. 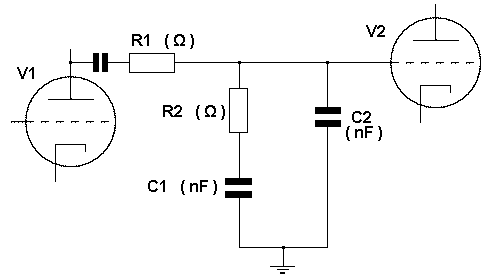 For example, a 12AX7 used in a grounded-cathode configuration with a 150k plate-load resistor results in an output impedance of roughly 44k (62k in parallel with 150k). When this value is added to equalization network 75k, the error becomes more noticeable and moves in the opposite direction, giving a positive boost at 10Hz (+2.74dB). If we reduce resistor R1's value to 37k without changing C1 and C2 value, the output returns to close to flat, but with a slight bump (+0.05dB) in low bass.